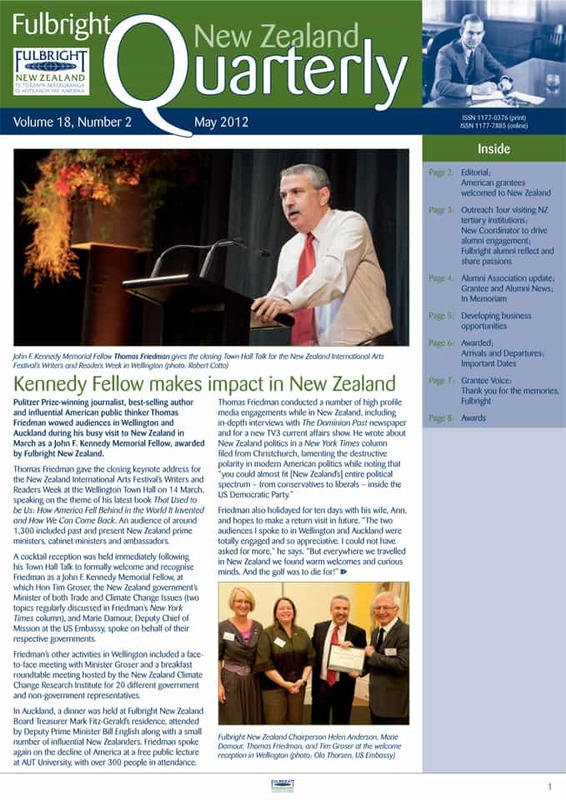 The May 2012 edition of our Fulbright New Zealand Quarterly newsletter is online now! In this issue, read about Pulitzer Prize-winning journalist, best-selling author and influential American public thinker Thomas Friedman’s recent visit to New Zealand as a John F. Kennedy Memorial Fellow; our February orientation for newly-arrived American grantees; our current 2012 Outreach Tour to university, polytechnic and w﻿﻿﻿ānanga campuses nationwide; our new Alumni Coordinator; the Fulbright Reflections series of alumni talks; and our strong focus on business development. Current Fulbright New Zealand Graduate Student Eryn Newman reports on her exchange to the US and we have the usual news updates from the Fulbright New Zealand office and the Fulbright New Zealand Alumni Association, details of our latest grantees, alumni news in brief, and a full list of available awards.